The tannins in unripe persimmons are thoroughly unpleasant, so it's no wonder that folklore has arisen to teach us how to ripen the fruits. Every real Appalachian knows that frost ripens persimmons, and some of us even go so far as to simulate the frost. 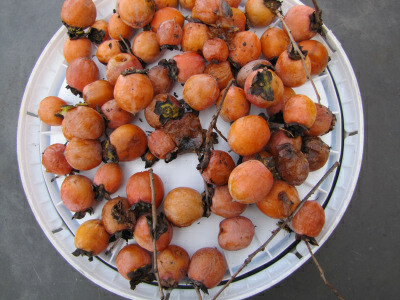 I once put a bag of persimmons in the freezer then pulled them out a week later, hoping they would be sweet and ripe. When I went over to visit my movie star neighbor last week, I saw that he had laid his persimmons outside in a platter so that a hard freeze would ripen them up. Too bad we were both on the wrong track. Scientists have discovered that persimmons ripen like most other fruits, and that frost near the time of ripening is purely coincidental. 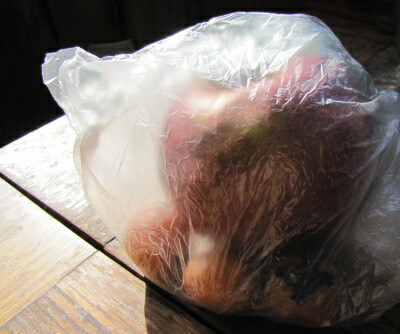 That said, you can hasten the ripening of your fruits by putting persimmons in a plastic bag with an apple. The ethylene released by the apple will make your persimmon ripen up as long as the persimmon fruit has already become somewhat soft on the tree. What do you do if you bite into a persimmon and the puckery astringency makes you spit it right back out? I tested a few puckery persimmons on our flock, and our chickens gave persimmons two thumbs up. In fact, the persimmons started a soccer match --- the most intense one I've seen among our flock yet. Clearly, chickens think persimmons are delicious, tannins or no tannins. 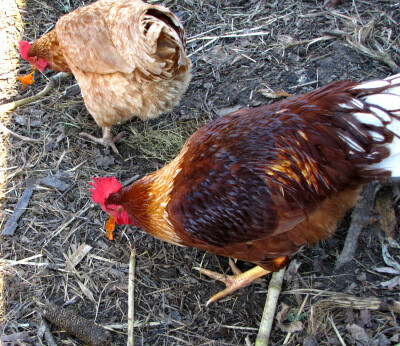 Keep your flock happy and healthy with a homemade chicken waterer. What do you do?! You blame Anna! Since she's the one who gave it to you! I still haven't recovered from that persimmon. Just think --- this means you've been replaced in my life by a flock of chickens. Here's the "no-fail" method. Get yourself a soup bowl and pour in a generous cup-full of -strong- alcohol (it must be more than 35% and preferably above 40%, but should not be a strongly flavoured liquor -- a strong vodka is a good choice). Dip the -stem- end of the persimmon into the alcohol (there's no need to fully immerse it) and place them onto a couple of sheets of clean newspaper in the bottom of a large plastic bag. Place the fruit in a single layer and seal the bag to make it airtight. Store it in a dark place (inside a cardboard box is fine) at room temperature for 8 to 10 days. Check the fruit daily after 8 days. You will end up with soft, juicy, sweet persimmons with no trace of astringency. Note for those not familiar with persimmons - if it's soft and mushy and comes apart in your hands, it's -ripe-, not bad: eat it, don't throw it away! Fascinating! I wonder what the alcohol does to make the persimmons ripen? The alcohol causes the persimmons to release ethylene alcohol which makes them ripen faster. Apples also release this gas and can be used.